Something weird is happening to spring. It’s starting earlier and earlier—but not everywhere. The shift is limited to cities and heavily-populated areas. Late last year, a research study suggested that the spring season’s start was creeping slowly forward so that, by 2100, spring would begin almost a full month earlier than it does today. 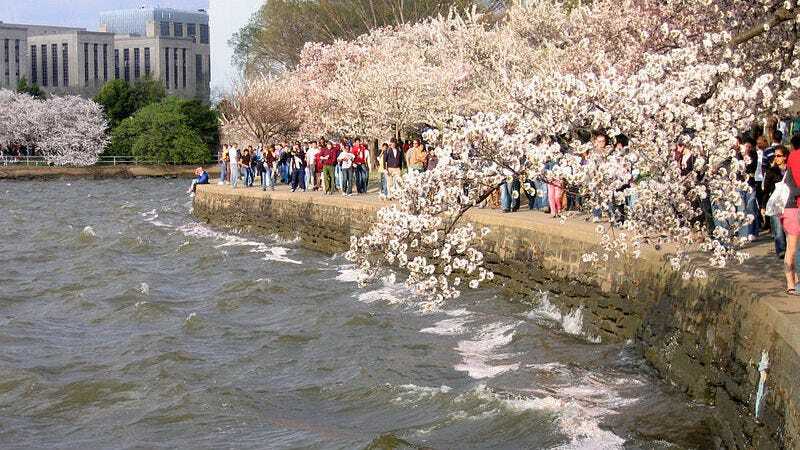 Now, a new study from researchers at the University of Exeter in Proceedings of the Royal Society B concludes that spring’s start has already shifted forward by a full week—but only in heavily-populated areas. The Exeter team believes the cause is light pollution at night. The researchers used a combination of ground observations of the dates when the trees first began to bud and satellite data showing light pollution at night. In areas heavily lit up by street lamps and neon signs, the trees were in bud on average 7.5 days early. But the onset of spring in the darker countryside, even in adjoining areas, was unchanged. The shifting season is also potentially catastrophic to the delicate relationships between plants and animals. Lead author Richard Ffrench-Constant, described the “cascading effects” of the change, which could drastically change which species will or won’t thrive. Now that researchers have identified the link between light pollution and seasonal shifts, they intend to pass along the data to cities. Perhaps with a little less light from the ground, spring will stay right where it is.